Derby County continue their search for lower league gems as they take a look at Netan Sansara. Sansara took place in the Rams 6-2 reserve win over Barnsley this week, playing for the full 90 minutes. 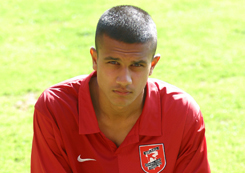 Twenty one year old Sansara is of Indian extraction and had the honour of being the first British born Indian to play for England when he took to the field for the England U18 side. His career as a left sided defensive player has not always run smoothly and was released by Walsall in August of 2010. This followed an unsuccessful trip over the border to Dundee. He initially moved to Dundee on a months loan but was sent off in his first outing for Dundee for two yellow card offences. Just five days later and just one more game for the Scottish club he was sent back to Walsall.